There's a GURPS book for everything, right, so why not one for a year? Oh, okay, I'll be serious . . . Whenever we release a new GURPS item, I go over to our forums and advertise it a little . . . and every time, people mention that they've added it to their wish list, or plan to pick it up with Christmas money. Since it's easy to forget a whole year's worth of stuff, and because this is the season for retrospectives, I'm going to look back over 2010 and remind everybody of just how much we accomplished in the past 12 months. 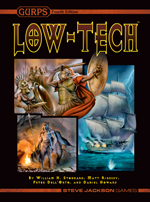 The shining star of 2010 was, without a doubt, GURPS Low-Tech (also in hardback). This was one of the most anxiously awaited Fourth Edition releases! And it didn't turn up alone, but with two of at least three planned supporting publications: GURPS Low-Tech Companion 1: Philosophers and Kings and GURPS Low-Tech Companion 2: Weapons and Warriors. Not that people weren't waiting for many other things, like GURPS Psionic Campaigns and GURPS Psis, which support GURPS Psionic Powers. Or GURPS City Stats, the first stats format we've ever published as a game supplement rather than as a style guide for writers. And then there were surprises, like GURPS Alphabet Arcane: Lost Serifs and GURPS Big Lizzie, and of course GURPS Crusades, an old-school historical worldbook that makes a fine accompaniment to Low-Tech. A couple of existing series grew significantly, too. GURPS Spaceships made it to 8, with Divergent and Paranormal Tech and Transhuman Spacecraft. 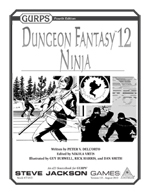 And GURPS Dungeon Fantasy went past 11 and all the way to 12, with Summoners, Taverns, Power-Ups, and Ninja-ja-ja-ja. We also kicked off several completely new series! 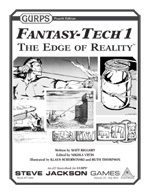 GURPS Fantasy-Tech 1: The Edge of Reality and GURPS Supporting Cast: Age of Sail Pirate Crew could both double as Low-Tech support . . . but we hope to release future volumes in these two series, and these won't limit themselves to TL0-4. GURPS Magic: Plant Spells expands the Plant college in GURPS Magic, and we aim to see other magical colleges get supplements in this series. 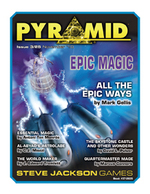 Throughout all this, Pyramid provided excellent support for all of GURPS. This year saw the publication of issues #3/15, #3/16, #3/17, #3/18, #3/19, #3/20, #3/21, #3/22, #3/23, #3/24, #3/25, and #3/26. We didn't overlook the GURPS Classic project, either, releasing PDF versions of the Third Edition classics Alternate Earths 2, Atomic Horror, Blood Types, Illuminati, Middle Ages 1, Undead, Vikings, and Y2K; Alien Races 3, Nobles, and Star Mercs in the GURPS Traveller series; Frozen Hell and Motor Pool in the GURPS WWII series; and Transhuman Space, Broken Dreams, Deep Beyond, Fifth Wave, High Frontier, and In The Well in the Transhuman Space series. I was going to start in on my predictions for 2011 here, but I'm out of space. Tune in soon for that! But before I go, I want to say thank you for the great year! The fact that I had so much to say about 2010 and have to write about 2011 in another article is a testament to the loyalty of GURPS fans.